This intensive course Permaculture Design Course (PDC) follows the principles and material designed by Bill Mollison, Australian researcher, author, scientist, teacher, biologist and co-founder of the Permaculture Design System. During the course we will not only spend a significant amount of hours with the knowledge, science and legacy of Bill Mollison but we will also get our hands dirty on the land, applying practical principles and learning about how to map swales on contour, how to build raised hugel beds and how to improve soil health. This course is relevant to people from all origins and walks of life. It includes an in depth understanding of the different applications of Permaculture and provides the relevant knowledge and experience for anyone wanting to start a vocation as a permaculture designer. It is equally appropriate for someone who simply wants to step further into Permaculture design in their own lives. 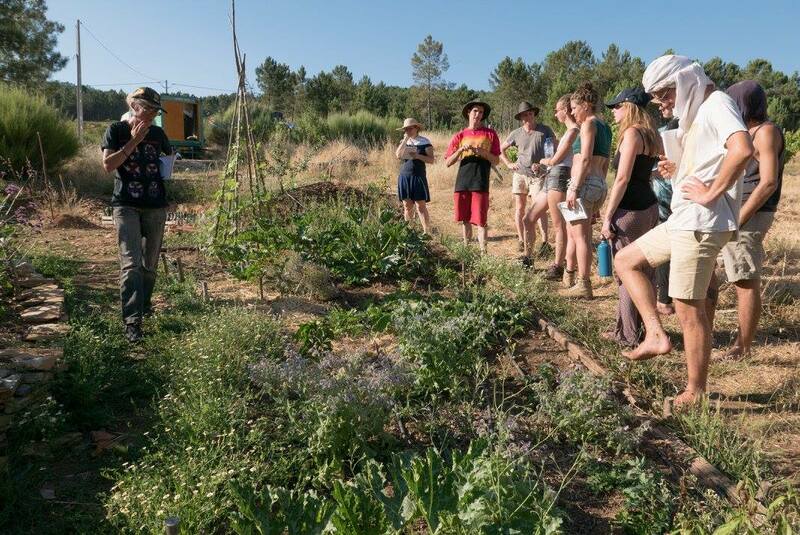 No previous experience is required but we recommend if you have had no previous contact with Permaculture and simply want to know what it is you may benefit from doing an introductory course first. We use a wide range of teaching methods to create an engaging environment which includes all participants and their individual learning styles. This includes practical activities, discussion/constructive debate, games, white board sessions, digital presentations, videos, observation exercises, guided walks and working in groups. Every student receives an internationally recognised certificate from the Permaculture Association UK which will be awarded on completion of the whole course including a design workshop at the end of the course and finishing with a presentation of designs in which participants will illustrate what they have learnt. Introductory: Permaculture ethics; approaches to design; guiding principles of Permaculture; biodiversity; learning and study strategies; pattern in design; wilderness and wildlife; evidence / why we need Permaculture. Cultivated Ecology: Permanent pasture; forest gardens; horticultural techniques; no-till cultivation; biological pest control. Climates: Strategies for different climates; microclimates; buildings and structures; urban Permaculture; appropriate technology; waste reduction; the home and workplace; energy efficient planning; waste recycling and disposal. Soils: What is Living Soil? ; Soil regeneration techniques and soil conservation. Water in Landscape: What is living water? ; water conservation, collection and storage; wastewater and sewage treatment; Aquaculture. Forests and Trees: Energy transactions of trees; woodland establishment; types of forest; woodland management. Invisible Structures: Real wealth; land access; formal/informal economy; community development strategies. Design Workshop: Design process and presentation skills; maps and overlays; surveying; project planning. We include a range of other relevant subjects and practical exercises which aim to give each student a tool kit of basic skills to get started with confidence. This course will also provide opportunities for students to learn more about gardening, Eco building and community living herbalism and more. If you like to receive more information, don't hesitate to contact us. Let's build dreams! We have accredited approximately 220 students in 18 courses since 2012. Below is a list of past course dates and locations.